A hurricane hunter with the National Oceanic and Atmospheric Administration flew through the eye of Florence this week, capturing this video. 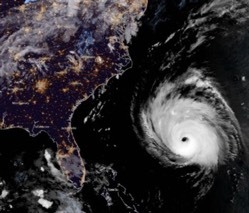 Many people have been praying for a miracle, and Florence is expected to weaken somewhat on Thursday, but it's still predicted to be an "extremely dangerous major hurricane when it nears the US coast." National Weather Service officials warn of the potential for "unbelievable damage from wind, storm surge, and inland flooding with this storm." "This storm is going to knock out power days into weeks. It's going to destroy infrastructure. It's going to destroy homes," said FEMA's Jeff Byard. North Carolina Gov. Roy Cooper also did not mince words, saying, "The waves and the wind this storm may bring is nothing like you've ever seen. Even if you've ridden out storms before, this one is different. Don't bet your life on riding out a monster." The governor urged locals not to hunker down but to leave. Cooper continued, "We need people to evacuate, they're putting their own lives at risk, as well as the lives of first responders." On the ground, millions of people in the Carolinas and Virginia are heeding the call to evacuate. Along with the deadly winds, forecasters say the coastal surge from Florence could leave the eastern tip of North Carolina under more than 9 feet of water in spots. Thousands of disaster response crews are preparing for the worst. In Virginia Beach where mandatory evacuation orders were issued for Sandbridge Beach, CBN News spoke with Battalion Chief Chris Ludford with the Virginia Beach Fire Department. There are several threats associated with Hurricane Florence. Ludford says he believes the biggest threat for Sandbridge and the Back Bay Wildlife Refuge is tidal flooding. "And that coupled with standing water due to heavy rains ... Those are going to be the two things that we worry about most here," Ludford said. The National Hurricane Center predicts as much as two to three feet of rain in parts of North and South Carolina which could lead to "catastrophic flash flooding." Subscribe for free to Breaking Christian News here.